I think two of the biggest celebs I've talked to are also my two favorites. 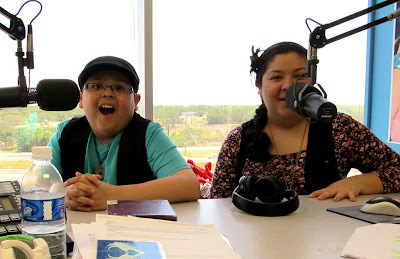 Raini and Rico Rodriguez are from Bryan, TX, which is the next town over from where I am now, and have stopped by my studio a few times now. The first time we played Truth or Dare and had a lot of fun, but this time we talked all about Raini's movie that is premiering on Friday: Disney's "Prom." To give away some prizes, we took calls on crazy prom stories. Some were typical, but some were very clever and the one we picked definitely had me shocked at the end. It was crazy. I also caught up with Rico a little bit! He told me all the shows he's been making cameos and guest spots in [which I LOVE!!] and how he's staying busy. Plus: Raini is going to be starring in a new Disney Channel show! We broadcasted the entire thing live on UStream and took a bunch of pictures, so if you want to see exactly how it all went down, click the pic below! They're just too incredible for words. I love them and their family.